ADF (Aerosol Dispensing Forum) and PCD (Packaging of Perfume, Cosmetics & Design) announced the winners of the Innovations Awards at an Awards Ceremony yesterday during the show. Show director Christelle Anya, and master of ceremonies Paul Austin of Austin Advisory Group, presided over the ceremony. Each of the winners received a special trophy and presented a short talk on what made the winning entry so innovative. 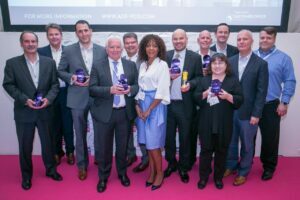 The Innovation Awards, now in their second year, recognize outstanding achievements and encourage the industry to push the boundaries with technological and creative innovations in aerosol, dispensing, personal care and cosmetic packaging. “I really enjoyed participating in the ADF&PCD awards jury. It was very exciting to see the many innovations in materials, design, manufacturing methods, and decoration up for consideration for awards this year,” enthused Lorraine Keyes-Ahart, Clinique Global Package Development at Estée Lauder. Ian Nicholson, Worldwide Director Strategic Innovation & Technology Alliances at Colgate Palmolive, was also impressed by the quality of the entries, stating: "The award submissions are great examples of creative companies seeking to better meet the needs of their users, which is essential in delivering superior business results."